During each monthly Sanford/Lee County Stroke Support Group meeting, there will always be a typical group of between fifteen to twenty participants who will head to the Enrichment Centre, located in North Carolina. All of these individuals are stroke survivors, many also have replacement joints and most were afflicted with aches and pains. However, all of them have one thing in common and that is they practice yoga on Thursday afternoons. They first got introduced to chair yoga during a group meeting featuring a special presentation by Raleigh-based yoga instructor Howie Shareff. Howie is in his 50s and he is also a former dentist. For his elderly students, this would be the yoga style he normally teach. In fact, just several years ago, he took it up himself after suffering from a multitude of health problems including a stroke, arthritis, hip surgery and neck surgery. 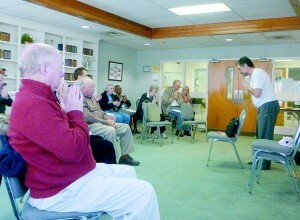 Chair yoga caters to the elderly as it can be done seated. It tends to focus more on improved posture and breathing. According to Howie, it also has the ability to improve both confidence and mood, as well as impact physiological factors including blood pressure, nerves, oxygen intake, line of sight, alertness, back pain and core strength. During the session, he also taught the participants how to use long breaths and backward counting, which are key components to meditation. This will enable them to have an easier time falling asleep, regain their composure under stressful scenarios or take their mind off of situations like long waits at the doctor. He also mentioned that yoga and meditation only requires participants to modify their actions and reactions. “Yoga is not a religion, it’s a health practice,” he stated. He added that it is a type of self-preservation. One of his audience member agreed with his statement. She recalled herself learning yoga as a young girl and since, has always used it for pain management, even when she was battling with cancer. Several others volunteered tips and personal anecdotes while Howie was available to assist in making sure that they had the most suitable posture possible. This is the kind of self-confidence that group facilitator Joy Phillips Murphy, a 30-year stroke survivor herself, said she loves to see. “A stroke is a lifelong journey, mild or severe. You have quite a lot of mental things to deal with, as well as the physical. … Being with other people going through the same things you’re going through really helps. You say, ‘They’re doing it. I can, too.’ It gives you courage,” explained Joy, who suffered a trauma-induced stroke when she was only 27, leaving her whole left side paralyzed for a time being. For the full story, read it here. OMG Yoga offers a wide range of yoga styles. We strongly believe that there is something for every individual. Be sure to check our website to learn more.